Failure to thrive is a medical condition where an infant/child fails to grow or gain weight appropriately over a consistent period of time. In orphanages, the number one cause of Failure to Thrive is simply a lack of touch, stimulation and love. A child may even die due to missing these essential requirements for growth. For some infants, failure to thrive may be caused by an inappropriate mixture of powdered formula and water, resulting in a watered-down diet that is inadequate to meet the baby?s nutritional needs. Touching, holding and talking to an infant are required for proper stimulation. Without this stimulation, the child looses the motivation to eat and brain development is delayed. This is similar to a deep depression in that the baby seems to give up on living. The child may appear thin, very sad, weak and pale. They may show no interest in human interaction and even withdraw from touch. They are prone to infections, heal slowly and may have abnormal posture. Adversely, they may be overly aware of their surroundings, jumpy, irritable and angry. 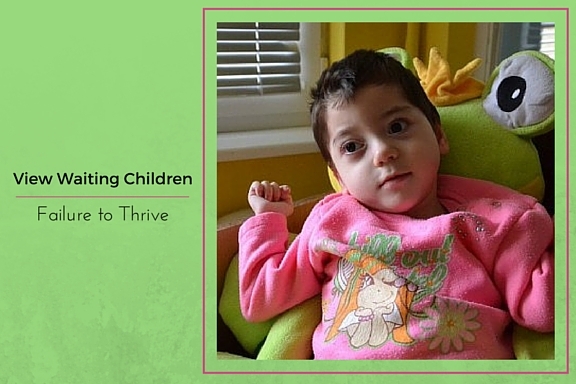 A doctor should examine the child for underlying disease medical cause for Failure to Thrive. If no underlying medical issue can be found, it must be assumed that the child has ?given up? on life. New adoptive parents must provide a thoroughly consistent care-schedule to build trust with the child. Maintaining eye contact with the child, frequent touching and caressing as well as talking lovingly to the infant//child will help stimulate him to eat and grow normally again. Colorful toys, textured blankets and playmates can all help stimulate a failure to thrive child. Encouraging eye contact, holding the baby during feedings and singing to the infant can help as well. Failure to thrive infants need loving care and stimulation to grow normally.